Rapid development is great, and Anvil lets you build web apps amazingly fast. But sometimes you need more. You need tracking, collaboration, code review, versioning. In short, you need source control. Today, we’re announcing availability of Git access for your Anvil apps. It’s simple: each Anvil app is its own Git repository. Just clone the repository, and you can pull, push, edit and merge Anvil apps right from your workstation. Now you can collaborate on multi-person teams, manage deployment and staging environments, and integrate Anvil into your code review process. You can find everything you need to clone an app with Git in the Anvil app editor. 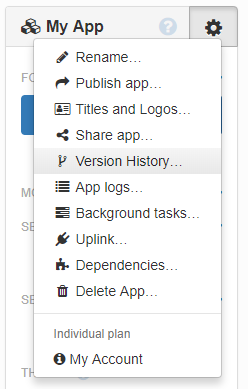 Just select Version History from the Gear menu , and click Clone with Git.